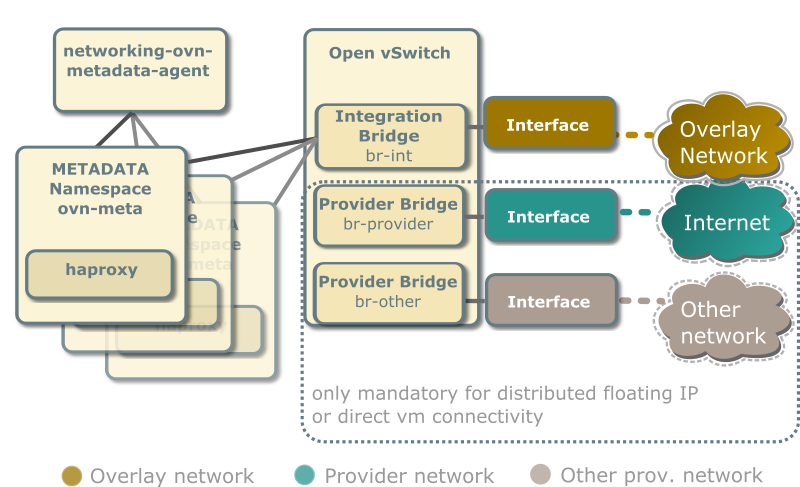 The reference architecture defines the minimum environment necessary to deploy OpenStack with Open Virtual Network (OVN) integration for the Networking service in production with sufficient expectations of scale and performance. For evaluation purposes, you can deploy this environment using the Installation Guide or Vagrant. Any scaling or performance evaluations should use bare metal instead of virtual machines. 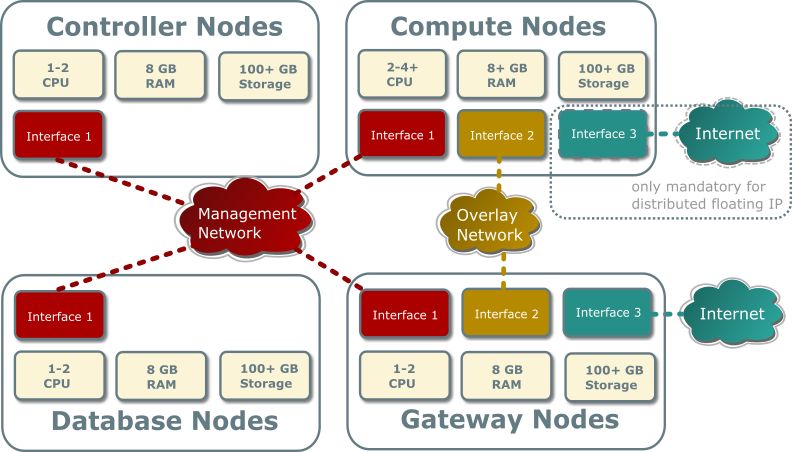 The reference architecture includes a minimum of four nodes. For functional evaluation only, you can combine the controller and database nodes. Three network interfaces for management, overlay networks and provider networks. Each OVN metadata agent provides metadata service locally on the compute nodes in a lightweight way. Each network being accessed by the instances of the compute node will have a corresponding metadata ovn-metadata-$net_uuid namespace, and inside an haproxy will funnel the requests to the ovn-metadata-agent over a unix socket. With networking-ovn, all the E/W traffic which traverses a virtual router is completely distributed, going from compute to compute node without passing through the gateway nodes. N/S traffic that needs SNAT (without floating IPs) will always pass through the centralized gateway nodes, although, as soon as you have more than one gateway node networking-ovn will make use of the HA capabilities of ovn. In this architecture, all the N/S router traffic (snat and floating IPs) goes through the gateway nodes. The compute nodes don’t need connectivity to the external network, although it could be provided if we wanted to have direct connectivity to such network from some instances. $ ovs-vsctl set open . 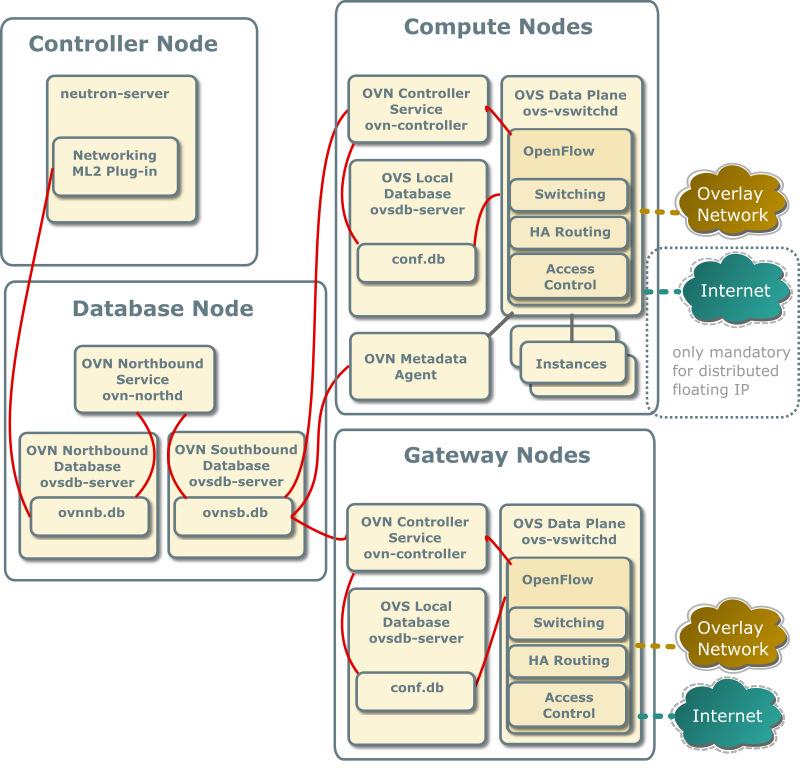 external-ids:ovn-cms-options="enable-chassis-as-gw"
In this architecture, the floating IP N/S traffic flows directly from/to the compute nodes through the specific provider network bridge. In this case compute nodes need connectivity to the external network. The Networking service creates a unique network namespace for each virtual network that enables the metadata service. Several external connections can be optionally created via provider bridges. Those can be used for direct vm connectivity to the specific networks or the use of distributed floating ips. OVN stores configuration data in a collection of OVS database tables. The following commands show the contents of the most common database tables in the northbound and southbound databases. The example database output in this section uses these commands with various output filters. By default, you must run these commands from the node containing the OVN databases. When you add a compute node to the environment, the OVN controller service on it connects to the OVN southbound database and registers the node as a chassis. The encaps field value refers to tunnel endpoint information for the compute node. Each security group will map to 2 Address_Sets in the OVN NB and SB tables, one for ipv4 and another for ipv6, which will be used to hold ip addresses for the ports that belong to the security group, so that rules with remote_group_id can be efficiently applied. In the above entries, the address set name include the protocol (IPv4 or IPv6, written as ip4 or ip6) and the UUID of the Openstack security group, dashes translated to underscores. Launching an instance causes the same series of operations regardless of the network. The following example uses the provider provider network, cirros image, m1.tiny flavor, default security group, and mykey key.